Glaciarium is a modern center devoted to the Patagonian Icefield and its glaciers, one of the few glaciological interpretative centers in the world. To create a space for entertainment, recreation and development of cultural activities. To support and raise awareness about the research and scientific work that may help to improve the knowledge of glaciers and Patagonia. To promote interest and knowledge of glaciers and glaciology. To share the wonders of the Patagonian region and its history, and encourage caring for the environment. Designed as an environment that promotes knowledge and awakens the senses, Glaciarium seeks to emotionally move the visitor through noble visual and narrative resources. For that purpose a live, interactive and entertaining space was designed, filled with visual and sound stimuli, which fosters the knowledge about the world of glaciers and enriches any visit to Patagonia. By following the current exhibition techniques used by museums and interpretation centers around the world, contents are exhibited in several ways: visual and light effects, multimedia programs and audiovisual presentations. The ice, the glaciers and their formation and the dynamics of their exciting phenomena inspired the architecture and design and encouraged the creative development of texts, scripts, illustrations and images exhibited in Glaciarium. The architecture is expressive and connotative, as a giant sculpture set on the Patagonian steppe that merges with the environment. Lugares Magazine has been present in the tourist market for the past 17 years, encouraging its followers to travel all over Argentina and the world, with an exploratory spirit. Lugares awards are given every year, acknowledging the main representatives of the national tourist market, in the following 8 categories. Country Farms and Estancias, Luxury Hotel, Museum, Character, Guides and Small Adventure Tourism Companies, Activities, Gourmet. 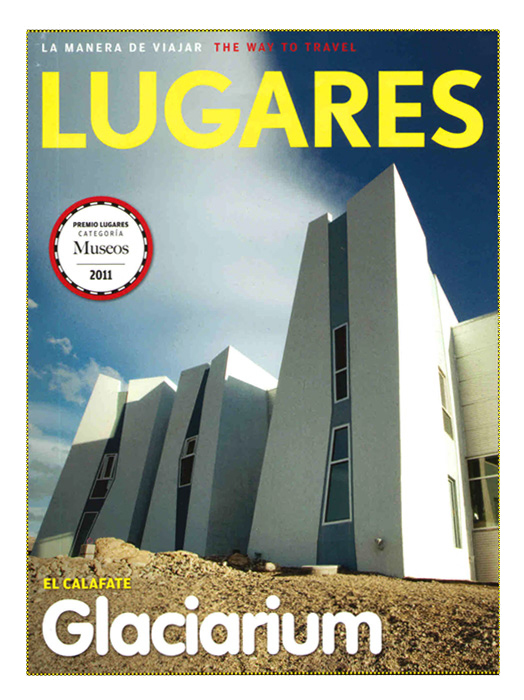 Our thanks to Lugares Magazine, for nominating Glaciarium as the Best Museum in Argentina in 2011.